The way I did it was I spliced into a wire at the ECM. Then ran it through a switch and grounded it. When the switch is off, the fans work just like normal from the ECM. When on they wire is grounded and both fans come on. I mounted the small micro toggle switch I bought from radio shack in my ashtray. I'll see if I can find where I got the info from. Told you a story, I only tapped into the high speed fan wire. sorry about the late reply. now here is where i get confused. the switch was already ran when i got the car and i can tell this is not good just by the looks. 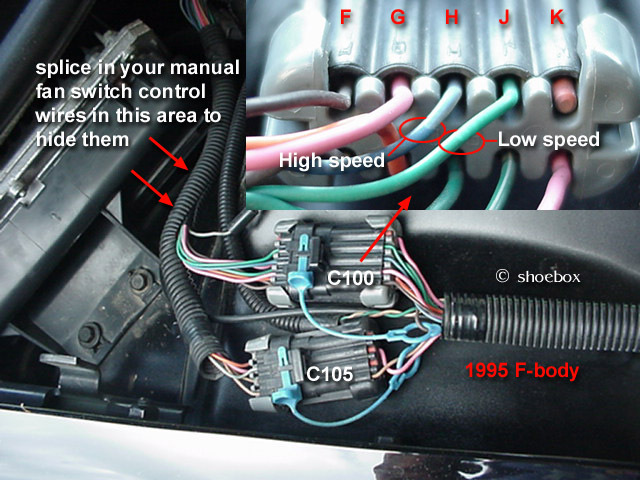 its a toggle switch with a wire jammed into the relay in teh pannel under the hood. it is throwing a code for QDM1 ( quad driver module 1) this is due to there being no relay. i went to the auto parts store and bought a relay unplugged the fan and plugged the relay in no fans came on and still a SES light is on. i bought a SLP fan override switch that is a direct fit into the wire harness and still with a relay plugged in i have had no luck with my fan. is there anyway my ECM/PCM is bad? The fan relays would be QDM #3.
ok how the hell do you post pics?? no im not 95 years old with huge glasses shouting damn internet machine!!! im 19 and what some would call a "hoosier" i just cant figure this out! Quick Reply: fan relay bypass?